Mondays, Wednesdays, and Fridays are my favorite days of the week for the sole reason that Net-a-Porter drops new merch. I’m embarrassed to say I can run late because I am too busy scrolling their shop What’s New category. How could a fashion girl resist? On that note…I came across two must have coats for fall that say forever. 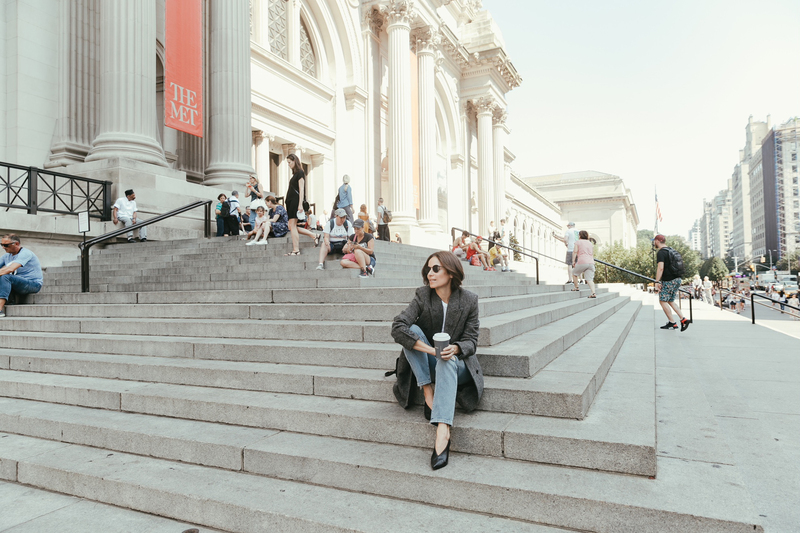 With so many trends coming and going each season, I prefer to invest in timeless pieces. 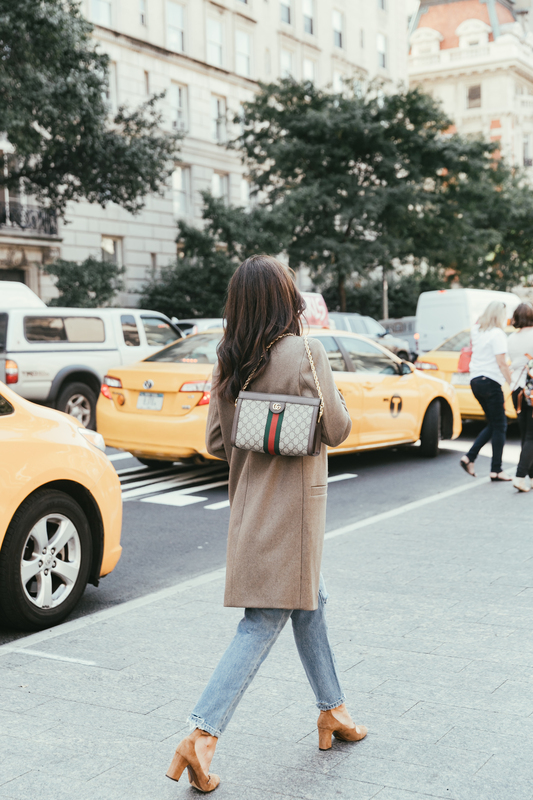 As a fashion rule of thumb, it’s wise to invest in quality coats, bags and shoes as that’s what makes the statement – everything else is icing on the cake, i.e. 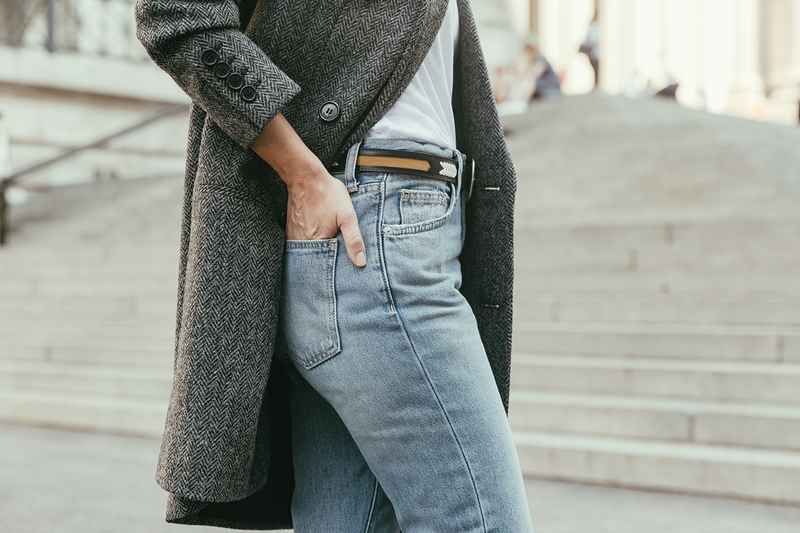 these cropped, high waisted Current Elliot jeans which I’m obsessed with. They have a perfect vintage wash and they graze my ankle at just the right spot. This lust have black and grey herringbone coat by Saint Laurent is the perfect throw on for causal denim days as well as fashionable nights out worn with black leather jeans or a little mini. I kept my look simple and paired it with jeans and a white tee. 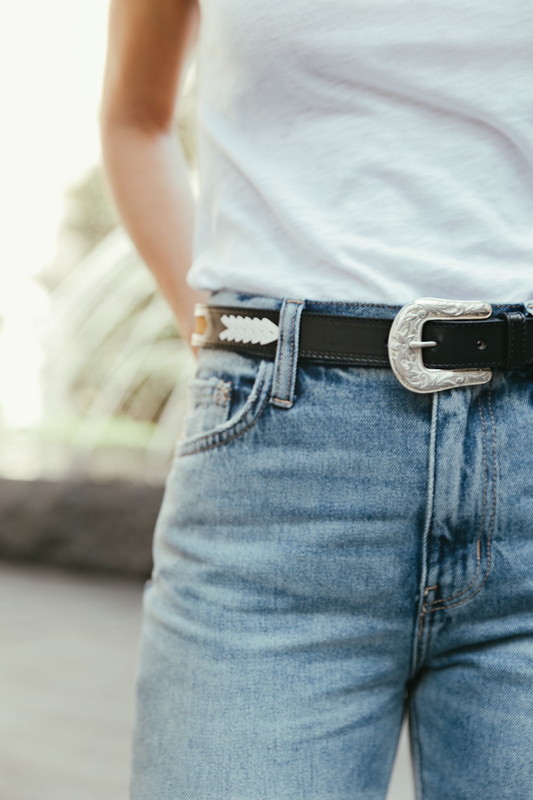 For a little extra, I added this new favorite Western inspired belt by Isabel Marant. It’s all about the details! I finished the look with a simple black structured crossbody bag, but there are many great ones that work well with this look. For a hands free, uber cool option, I really love this black leather belt bag by The Row that can be worn as a cross body for even a bit more edge. For classic elegance, check out this one by Saint Laurent. At a gentler price point, this half moon shaped bag by A.P.C. is a great option. This brand happens to be one of my favorite brands for its preppy French aesthetic. Speaking of A.P.C., this camel coat is a must have. I love the laid back coolness of this single breasted piece. The unstructured silhouette makes it easy to thrown on in the fall and great for layering over a chunky sweater come cooler weather. I paired this with the same Current Elliot jeans and switched up the bag and shoes for a more neutral tone. I love this classic multo Italiano Gucci monogrammed canvas bag and this navy and red suede one is also hot, especially when you want that extra pop of color. What coat are you falling for this season? Please comment below! 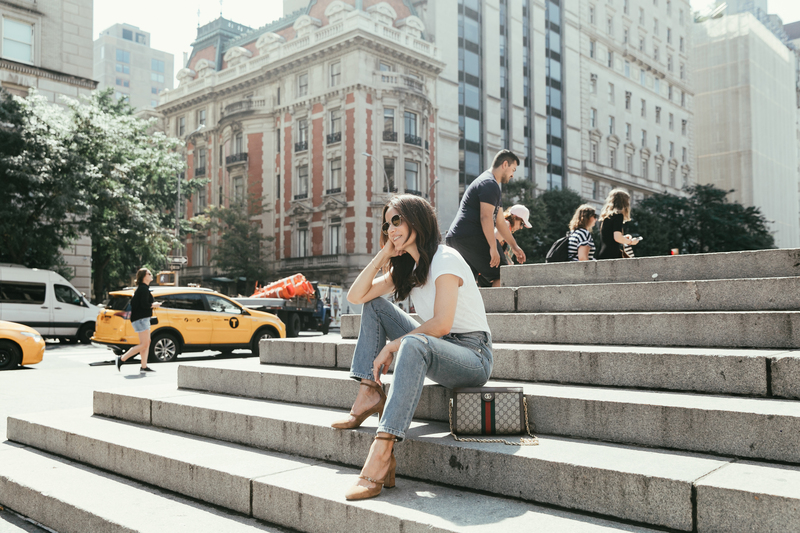 This post was written in collaboration with Net-a-Porter and Rewardstyle. All thoughts & opinions are my own. Seriously love your style! 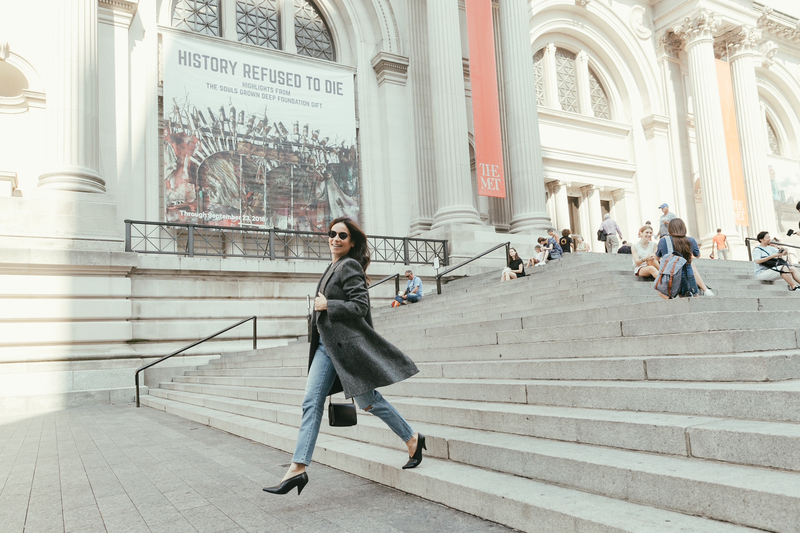 I’m still rocking a traditional peacoat for fall – basic black. I have a white one too, but it’s more for the wintertime, don’t-care-about-white-clothing-rules season. I always love a peacoat too! Great article! Love the shoes. Who makes them? Thank you! Shoes are by Tabitha Simmons. 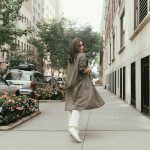 Great post and video on coat and jacket styles! I have the same shape as you and I have whittled my coat collection down too. I read long ago I shouldn’t wear double breasted coats so I avoid those and excess trim features. Your advice is so relevant to my age and lifestyle now (retired but active in clubs and organizations). Please keep up the good advice for our age group!